A single specimen of Englemann oak (Quercus englemannii) at the Los Angeles County Arboretum & Botanic Garden. Photographs by Frank McDonough, except as noted. A remnant Engelmann oak grove, one of the highlights of the Los Angeles County Arboretum & Botanic Garden, covers much of a knoll in the southwestern corner of the arboretum. Plant enthusiasts planning a visit for the first time should make an effort to include this naturally occurring population on their tour, especially during winter and spring. Quercus engelmannii is native to southern California and is commonly known as Engelmann oak, Pasadena oak, or mesa oak. It occurs in the South Coast, south Channel Islands, San Gabriel Mountains, Peninsular Ranges, and San Jacinto Mountains floristic regions, and in Baja California Norte. This species is somewhat of an outlier in California: its closest affinities are with Arizona white oak (Quercus arizonica) and the subtropical blue oak of Mexico (Q. oblongifolia), making it the northernmost subtropical oak species. 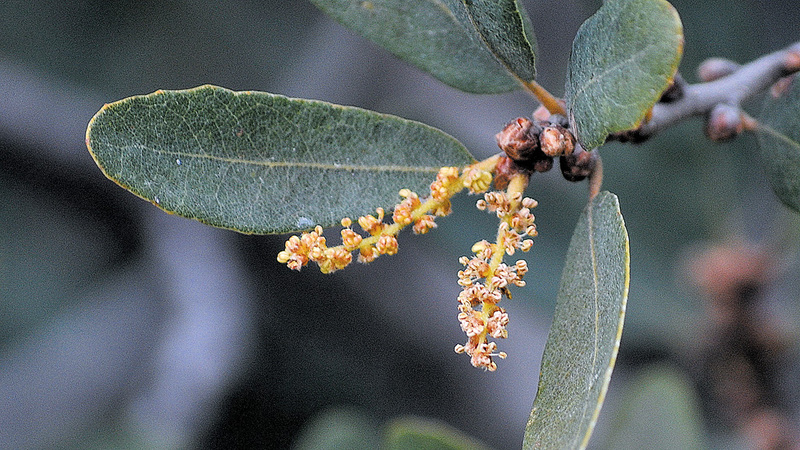 California botanists once considered Quercus engelmannii to be closely related to Q. douglasii because of similarities in habitat occurrence and leaf color, but such is not the case. Considerable variation in leaf form within a tree and among trees is common in California oaks but seems to be more prevalent in Q. engelmannii, possibly reflecting past hybridization with other oak species such as Q. corneliouus-mulleri, Q. dumosa, and Q. durata. 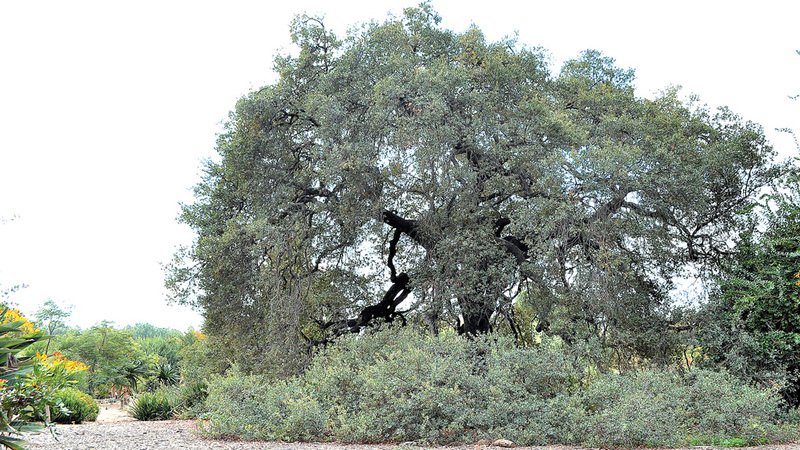 Like most oaks in California—and around the world—Engelmann oaks played an important role in the lives of the native peoples throughout this area. The local Gabrielino-Tongva tribes consumed the acorns. The Luiseño tribe, of Riverside and San Diego counties, made a type of porridge from the leached and ground acorns, and stored the acorns in granaries for use in winter. The Diegueño tribe, who lived in and around San Diego, made a similar porridge but also made a candy from pounded bark that was washed and chewed like chewing gum. The general form of the crown is rounded to elliptical, forming a thirty- to sixty-foot-wide canopy on trunks ranging from about fifteen to sixty feet tall. Mature trees are typically from fifty to eighty years old, but some of 150 years and up to 350 years can be found in most woodlands. Trees are usually single trunked, with angularly attached main limbs that are not much branched, unlike coast live oaks (Quercus agrifolia). Trunks are generally one to two feet in diameter, but may reach four feet on older specimens. Acorns are oval to cylindrical to about an inch long with rounded tips. The bark is brown to light gray to whitish and generally thick and heavily furrowed. Wood is dark brown and strong, but it warps and checks upon drying and, therefore, has little commercial value except as firewood. Engelmann oak belongs to the subsection Glaucoideae, which contains about twenty-five species from the American Southwest and Mexico. Species in this subsection are native to relatively arid areas—known to be some of the driest areas inhabited by oaks in North America—receiving nearly all of their annual precipitation during the summer months. A unique developmental feature of this oak group is a germination syndrome that situates the embryonic axis deeper into the soil than in other oak species; this is thought to be an adaptation to fire or drought, or both, and may be valuable in discerning ecological parameters that control its natural distribution. Fossil evidence indicates that the distribution of Engelmann oak once extended from the Pacific Coast of California east to Arizona, south to northern Mexico, and west to Baja California Norte. The climatic drying that resulted in the formation of the Sonoran and Mojave deserts caused the range to shrink from east to west, resulting in a much more limited distribution. Today, the population distribution in California is restricted to the following areas: 93% on the Black Mountains of central San Diego County; 6% on the Santa Rosa Plateau of Riverside County; 0.5% in Orange County; and <0.1% in Los Angeles County. The largest of the remaining populations occur near areas of the most rapid urbanization in Southern California, threatening the existence of the trees. The Los Angeles County Arboretum has a population of nearly 250 Engelmann oak trees, purportedly the largest extant population in Los Angeles County. Most of these trees exist on Tallac Knoll, a geologic remnant of the Raymond (Hill) Fault, which runs from the east fork of the San Gabriel River and Monrovia Canyon at the San Andreas Fault west and south to the Pacific Ocean. The scattered natural populations are restricted to habitats with adequate rainfall (at least fifteen inches per year), only rare occasions of frost, and moderate summer temperatures. Trees typically occur on gentle, south- to southwest-facing slopes, with deep loamy-clay soils or shallow rocky soils. Stands are generally associated with a source of summer water from nearby springs or streams, or from summer monsoonal rains. Seedlings are quite tolerant of fire, whereas mature trees may be killed if subjected to prolonged contact with flame (coast live oak demonstrates the opposite tolerances). Highest suitable elevation is considered to be about 4,200 feet. Individuals within a population typically form a canopy covering from ten to fifty percent, but almost never one hundred percent. 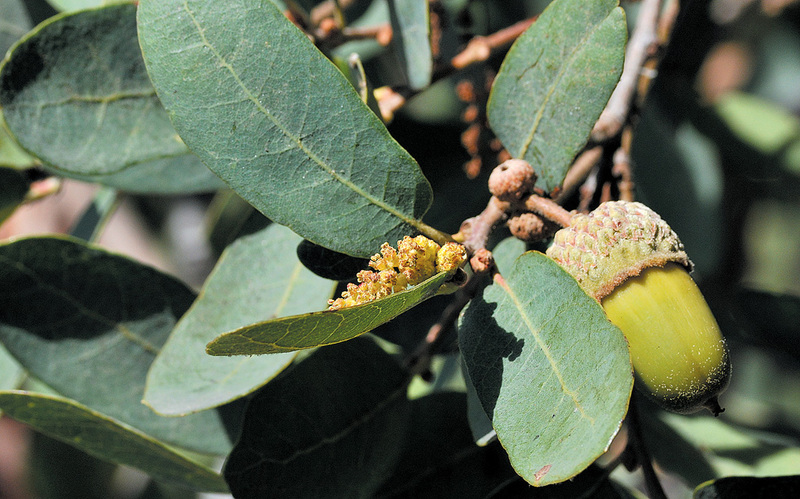 They are often associated with coast live oak, which is usually the dominant tree species. Today, populations often occur with an understory of exotic weed species, but the natural association is grassland and sage scrub consisting of Artemisia, Eriogonum, Mimulus, Nassella, Rhus, and Salvia species. Seldom noticed, the male flowers of Englemann oak are produced in catkins. Natural regeneration is poor within most of the extant Engelmann oak populations. No conclusive reason is known, but it seems to coincide with the introduction of grazing from sheep and cattle by early European settlers. Livestock compact soil and their browsing habits have a considerable negative impact on acorn survival (both fallen and on the tree), as well as on lower portions of the tree canopy. An obvious detriment to the overall population distribution is the supplanting of oak habitat by residential and commercial development. The fragmentation of natural populations into smaller islands of trees, due to development, was thought not to be significant, since oaks are wind pollinated; it may actually play a more significant role, resulting in lower rates of pollination and reduced acorn production, because the pollen does not travel as far as previously thought. Successful regeneration ultimately relies on three critical issues: acorn production, acorn germination, and seedling/sapling establishment. Studies indicate that acorn production may not be a limiting factor in regeneration. Adequate quantities of acorns are produced to support regeneration but are highly variable between individual trees and from year to year (without significant climatic influence). Natural germination generally occurs in early winter (late winter for coast live oak). The highest percentage germination occurs within the shade of parent or nurse-parent trees—as high as seventy-five percent. The remaining acorns germinate in half-day shade at or just outside the tree drip lines. They typically do not germinate more than a meter beyond the drip lines, because of lower soil moisture content there. Seedlings require some amount of sunlight for long-term survival, and that need increases with the age of a sapling. In ungrazed areas, the greatest mortality is due to dehydration; in grazed areas, greatest mortality is due to grazing. Engelmann oak acorns have a higher tolerance of moisture stress during germination than do coast live oak acorns. Engelmann oak acorns do not need to be buried in soil to germinate. When germinating, the embryonic root and shoot emerge out of the acorn and plunge deeply into the soil, perhaps making the seedling better adapted to more exposed habitats and bare ground than coast live oak. This unusual germination mechanism does not occur in coast live oak but does occur in other white oaks. Seedlings are capable of producing an extensive, well-developed root system with minimal top growth during their first growing season. They are also capable of resprouting after fire damage, drought stress, and grazing, although repeated dieback will weaken seedlings beyond recovery. Rodent activity (typically pocket gophers and ground squirrels) is generally more intense under the canopy, well within the drip line. One might think these zones would be beneficial to seedling growth, because of associated increased aeration and nutrient levels from rodent waste products, but such is not the case. The drip line, therefore, becomes a more suitable germination bed because of greater soil moisture content, “protection” from rodents, and higher light levels, which foster long-term establishment. Engelmann oak is likely susceptible to Pythium, Armillaria, Rhizoctonia and Phytophthora, but no cases of the latter (which causes Sudden Oak Death) have been documented. Engelmann oak is not a preferred host species of goldspotted oak borer (Agrilus auroguttatus), but it is host to several gall-forming insect species, and the acorns are predated by a number of beetles. The Santa Rosa Plateau is the only preservation area established specifically for Engelmann oaks and is managed by The Nature Conservancy. The Arboretum is in the initial stages of implementing a conservation management program for its grove. Several other oak conservation programs exist in the greater Los Angeles area and throughout the state. Some assume that, because this oak is native to Southern California, it will tolerate all of the climatic vagaries handed out by Mother Nature and be plastic enough to adjust; most authorities recommend that, when the annual precipitation is below normal (fifteen inches), supplemental deep and thorough monthly watering through spring is advisable. If summer temperatures are above normal (with extended periods of extreme heat), one or two supplemental applications of water are also advisable (in August and/or September). Apply the water several feet from the trunk, well into the drip zone and beyond; keeping the water away from the trunks helps avoid concentrated amounts of water soaking directly onto the main roots, which are the most susceptible to Armillaria. Any pruning should be restricted to the month of September, when the trees are most dormant. 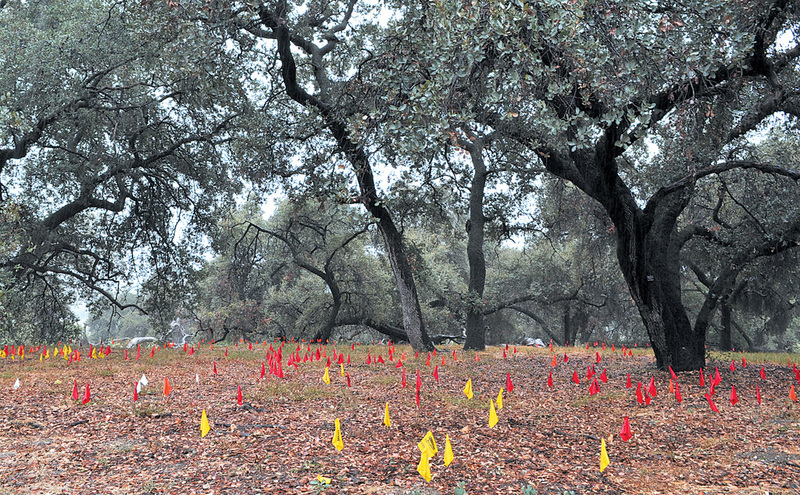 Red and yellow flags mark seedlings that have sprouted under the canopy of the Englemann oak grove on Tallac Knoll at the Los Angeles County Arboretum & Botanic Garden. Los Angeles County Arboretum & Botanic Garden is operated by the Los Angeles County Department of Parks and Recreation in conjunction with the Los Angeles Arboretum Foundation. The Arboretum is located at 301 N Baldwin Avenue, Arcadia, CA 91007. For more information call 626/821-3222, or visit www.arboretum.org for a map of the garden, a listing of current classes, events and special programs, membership form, and volunteer opportunities.